Hi and welcome! 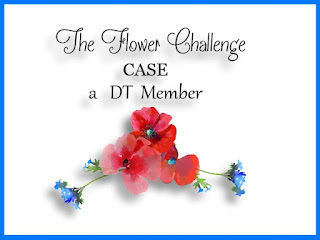 It's time for another challenge at The Flower Challenge and this month we are CASEing the Design Team. That's right - choose any of the design team cards and CASE it. For my card, I went with one of my favorite techniques - stenciling. I took a panel of white cardstock and placed a NBUS Hero Arts stencil on the left hand side. I then sponged over the top with Faded Jeans and Broken China Distress Oxide inks, keeping the darker color to the top. 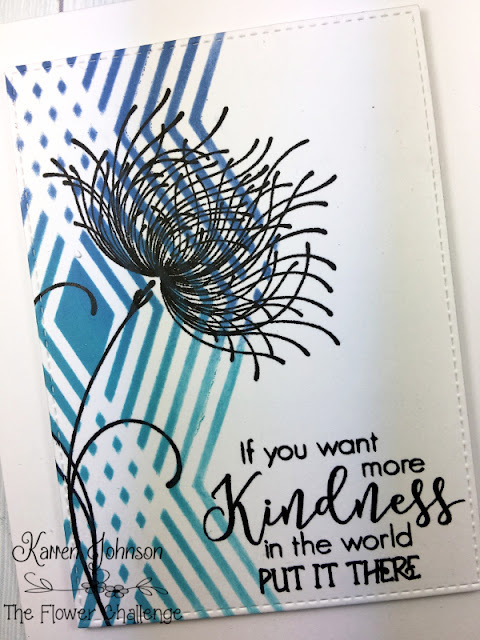 Once that was done, I stamped the gorgeous Penny Black Dreamy stamp in Versafine Onyx Black ink and this beautiful sentiment from SugarPea Designs. The panel was die-cut with a stitched die and adhered to a white card base with foam tape. Thanks for visiting. The Design Team have some wonderful designs to CASE so head on over and check them out. I'm linking this up to the Always Fun Challenge, who are looking for flowers this week. Love the graphic stencil combined with the organic flower! And that sentiment is great, too! Beautiful creation Karren,love the use of the stencil behind this flower. So eye catching. Fabulous CAS design, Karren! Distress Oxide inks seem to blend more softly in rich colors! The stenciling in ombre is beautifully done! 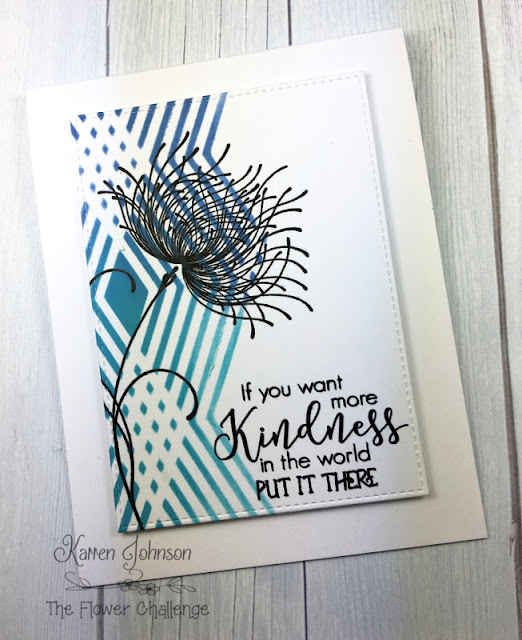 Oh, I really love all the movement you created with this bloom, and that you paired it with this fabulous stencil! Loving the ombre' effect, too! Really stunning card, Karren! love how this turned out Karren...gorgeous looking card. That stencil is amazing with the flower. Gorgeous! Love the graphic background design which really shows off the floral image and sentiment. Hi Karren :) The stencil is completely divine, especially in the gorgeous blues you have used. Love the flower stamp too. Lovely! Hello Karren: I love the striking detail of this lovely and graphic blue stenciling as a background for this delicate Penny Black flower, I love it, been after it because you can't go wrong with it, any color looks amazing with it and, when you emboss it with glitter looks gorgeous too. That sentiment is so profound and so very true, words and actions to live by. This is gorgeous!! I love that sentient, I love the background stamp and the black image against it. I just love it all!! Thanks for joining us at Always Fun Challenges. Hope to see you again soon! !